There are many reasons why someone may be scared of flying each person’s reasons being totally individual. Many people are unaware of the exact reason for their phobia, or sometimes when they can find an isolated cause, they are reluctant to disclose it for fear of ridicule or embarrassment. There are a great number of people who find it very difficult to relinquish control and hand the responsibility over to others. Many people are reluctant to put their safety into the hands of a stranger such as a pilot, taxi or bus driver or even a doctor, regardless or their training background, experience or capabilities. For many, a previously bad experience when flying has caused enough anxiety and dread of future flights, that an irrational fear has set in. They may have experienced an emergency landing, turbulence, severe delays, inappropriate behaviour from other passengers or from an accumulation of smaller but equally stressful encounters. If the phobia had begun in childhood, the chances are that this is a phobia gained from adopting the phobic behaviour of a parent or friend. A small child will expect that sort of behaviour displayed by the adult to be the correct management of the situation and copy the behaviour therefore learning a phobic response. 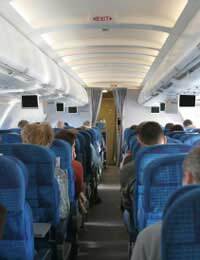 Many films feature either terrorist activity or mid-flight emergencies as the focal point of the story. This coupled with modern day special effects can provide very realistic, sometimes sensationalised images and plots that cause many people to be fearful of flying in case of such an event. News coverage, either in print or on the television, can also cause the general public to become very wary of flying and lead those with a normal level of concern to develop an anxiety disorder. A Fear of Being Scared. If a person has experienced a bad flight in the past, or has witnessed a negative experience, they may be so fearful of being frightened to such a degree again, that a fear of being scared exacerbates the problem. This can cause normal worry and concern to escalate into a full blown phobia causing panic attacks. How Does The Fear Present Itself? Some people who suffer with aerophobia will begin to have anxiety attacks simply upon watching an aeroplane fly across the sky. For others the panic begins when booking a flight; others may feel their anxiety level increase at the mention of a flight, especially if this is work related or for some other reason that is going to be very necessary. The mere sight of the airport, sounds of the terminal or overhearing the conversations of others can cause anxiety.Fear may be caused by association, for example, if the previous experience was bad, going to the same airport or with the same people can cause the person to develop irrational thoughts about the current flight and be scared that it is going to be the same as the previous one. Whatever a person’s reason for their fear is, it should be treated individually and taken very seriously as these high levels of anxiety can have a detrimental effect on health and lifestyle, causing further anguish to the sufferer. this material is worth reading and is going to be great help for me kind of people who have aveophobia. i would comment again after i m back from my first flight which i m going to ride in two days.